Preheat oven to 400°F and prepare 2 baking sheets by covering them with parchment paper. Carefully unfold the puff pastry sheets onto a flat surface to ensure there are no tears. Gently spread 2 ounces of cream cheese evenly onto each sheet, leaving the top inch uncovered. 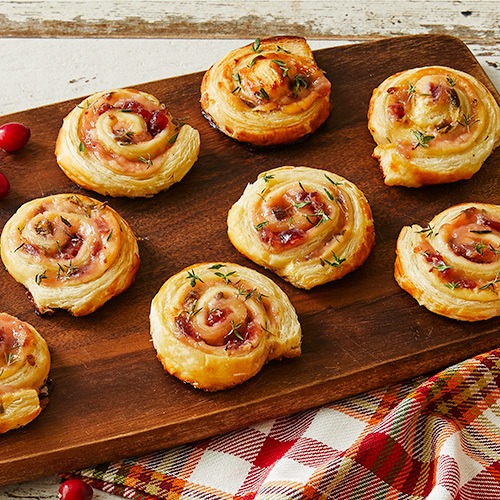 Spread the Hot Pepper Cranberry Jelly over the cream cheese and sprinkle each sheet with one tablespoon of thyme. Brush the top inch that was left uncovered with the egg. Beginning at the bottom, roll the puff pastry sheets tightly until you have completed the roll. Place in the refrigerator to allow it to firm up for about 30 minutes for ease with cutting. Remove and slice into 1/2” slices. Place each slice down on the prepared baking sheets and bake for 24-28 minutes, or until the slices have puffed and browned slightly. Garnish with additional thyme and serve warm.